Ethan attends St. Simons Elementary School and is in Kindergarten. When he is at school, he loves going to music class. Ethan has been a great leader for the Kindergarten and First grade group since he began in June. When he is at Boys &Girls Club his favorite thing to do with his friends is play pickle in the gym. At home, Ethan enjoys watching TV shows about Legos. He loves learning new things about sharks! Ethan wants to be a fire fighter when he grows up. Congratulations to Emma Willett! 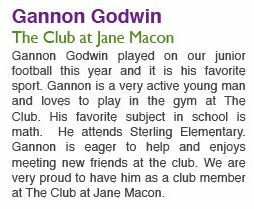 Emma is St. Simons Island Youth of the Month for December. Emma is in 3rd grade at Oglethorpe Point Elementary School. Emma loves going to school and enjoys learning about math. When Emma comes to Boys & Girls Club in the afternoon, her favorite rotation is in the Games Room. She loves to practice her gymnastics when she is not at the Boys & Girls Club. Emma loves gymnastics so much that she would like to teach gymnastics when she grows up! Jaylin Gibbons is the first receipient at the Teen Center. He is a Junior at Brunswick High School. 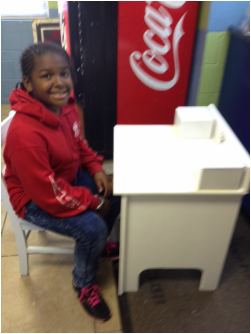 Amauri received her desk 12/11/2014. She is a 4th grader at Burroughs Moulet Elementary.